In Collins v. Virginia, police officers were looking for a motorcycle that they suspected was stolen. They tracked the motorcycle to a home where it appeared to be parked in the driveway and covered by a tarp. Officers walked up the driveway, removed the tarp, discovered the motorcycle and conducted a search of the license plates. The license plate search indicated that the motorcycle was indeed stolen. The officers then replaced the tarp over the motorcycle and waited in their car for the driver of the motorcycle. When Collins appeared, they arrested him. In the trial court, Collins made a motion to suppress evidence, claiming that the officers violated his 4th Amendment right when they entered the curtilage of his home and conducted a warrantless search of the driveway. The trial court denied the motion and Collins was convicted of Receipt of Stolen Property. 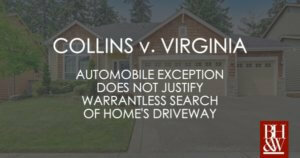 The Virginia appellate court and State Supreme Court affirmed Collins’ conviction, reasoning that the “automobile exception” to the warrant requirement applied to the search in this case. What is the Automobile Exception to the Warrant Requirement? Generally, the “automobile exception” to the 4th Amendment allows officers to search a vehicle without a warrant if they have probable cause. The rationale behind this exception is that automobiles should be treated differently than houses because of the “ready mobility” of the automobile. Virginia argued that the automobile exception should apply in this case, because the motorcycle was capable to being driven away from the home. The US Supreme Court, Justice Sotomayor writing for a nearly unanimous court, held that the officers violated Collins’ 4th Amendment right to be free from unreasonable searches and seizures. The Court emphasized that the area of the driveway where the motorcycle was parked was a protected area of the home. 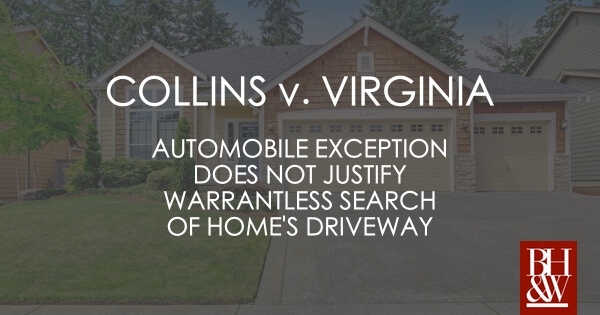 Nothing in this Court’s case law suggests that the automobile exception gives an officer the right to enter a home or its curtilage to access a vehicle without a warrant. Such an expansion would both undervalue the core Fourth Amendment protection afforded to the home and its curtilage and “ ‘untether’ ” the exception ” from the justifications underlying’ ” it. In holding that the search violated the 4th Amendment, the Court reversed the decision of the Virginia Supreme Court and remanded to case back to the state. The curtilage of the home extends to the driveway and items that might be found therein. Of course, if the officers had been able to view the license plates from the street, without removing the tarp, things would likely be different. However, as it stands, the Supreme Court is unwilling to adopt any rule that would allow police to enter the curtilage of the home to conduct a warrantless search. 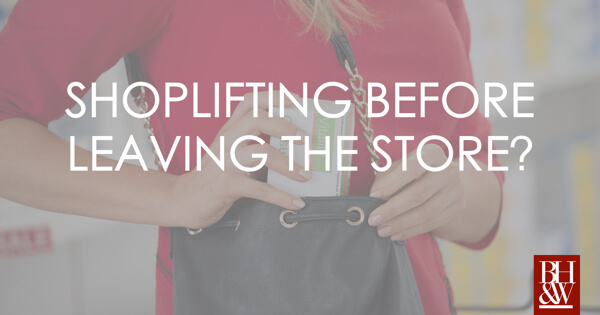 Can Police Arrest a Person for Shoplifting Before They Leave the Store? The Court of Criminal Appeals recently handed down a case regarding a police officer’s findings of reasonable suspicion and probable cause. The issue was whether an officer had probable cause to arrest a customer for theft from a store before she actually exited the store and when she claimed, after being confronted by the officer, that she was going to pay for the items shad had placed in her purse. A Corpus Christi Police Department Officer responded to a report regarding a customer in a Dollar General Store concealing store merchandise in her purse and jacket. Upon arriving at the store, the responding officer met with the employee and was given a description of the customer. The police officer approached a customer matching the employee’s description, identified later as Ford, and informed her that she had been seen concealing merchandise in her purse. Ford replied that she was not done shopping and had intended to pay for the items. However, the officer noticed that Ford had a shopping cart with store items that were not in her purse. The purse was covered by a jacket, which the officer picked up, and discovered that the purse was fully zipped up and full of merchandise. Upon removing the store items from her purse, the officer discovered six small baggies of methamphetamine and two pills. The State charged Ford with theft over $50 and possession of controlled substances. Ford was subsequently indicted for possession of methamphetamine. The drugs found on the defendant were discovered during a theft investigation. The defendant filed a motion to suppress the drugs. The trial court granted the motion to suppress. At the suppression hearing, the trial court acknowledged that a theft could be complete without the physical removal of the property; however, the court also observed that the defendant never tried to leave the store with the merchandise and “was still shopping.” Further, the court determined that there was insufficient evidence that the defendant intended to steal the merchandise because she did not attempt to leave the store, she did not run or try to conceal anything when approached by the officer, and she stated that she intended to pay for the merchandise. The trial court concluded that the “officer acted prematurely” in approaching the defendant and asking questions about the merchandise and that inferring an intent to steal was “too big a leap at [that] point.” The trail court questioned the reliability of the information provided during the suppression hearing as it all came from reports by the store employee and the police officer, both of whom were not at the suppression hearing to substantiate the information. On appeal, the State argued that the conversation between the police officer and the defendant was part of a consensual encounter and that the totality of the circumstances gave rise to probable cause to arrest the defendant. The court of appeals rejected the State’s first claim that the conversation was part of a consensual encounter, but agreed with the State that the police officer had reasonable suspicion to stop the defendant to ask her questions. The court of appeals held that the trial court erred in concluding that the officer lacked reasonable suspicion to conduct a stop. The court of appeals held that the trial court was within its discretion when it concluded that the State failed to meet its burden of proof establishing probable cause to arrest. This discretion was used when determining that the evidence used by the State was “questionable” with no one able to corroborate the information provided. 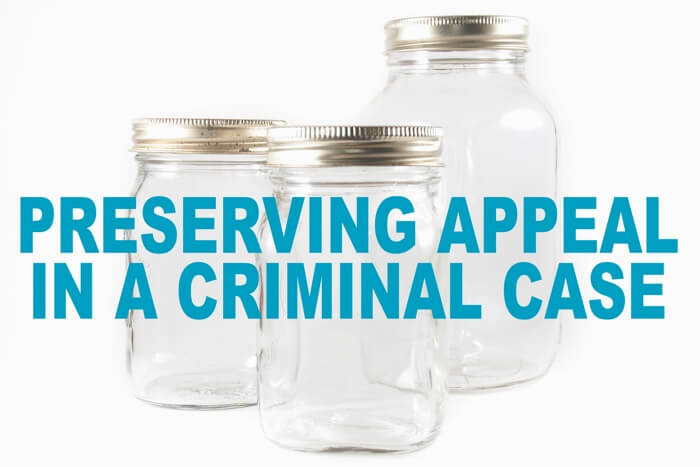 The Court of Criminal Appeals recognized that both the trial court and the court of appeals recognized that it was not necessary for the defendant to take the merchandise out of the store for her to commit theft. Nevertheless, both of the lower courts erred in concluding that the officer did not have probable cause to believe that the defendant intended to steal the items. The court explained that the officer had knowledge of at least four undisputed facts supporting the idea that the defendant intended to steal: (1) the store employee reported that the defendant was concealing items in her purse; (2) the defendant admitted to the officer that she had concealed items in her purse; (3) the shopping cart had items from the store that were not in her purse; and (4) the defendant’s jacket was covering her purse. 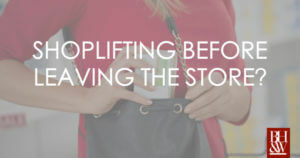 The fact that the defendant placed some items in her shopping cart but concealed others in her purse caused the arresting officer to believe the defendant was intending to steal the concealed items. The court supported this argument by referring to Groomes v. United States, 155 A.2d 73, 75 (D.C. App. 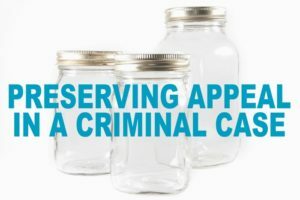 1959), in which the District of Columbia Court of Appeals heard a case—similar to this one—and concluded that once items are removed from the shelf and concealed or put in a convenient place for removal, the elements of a taking and appropriation are satisfied. Further, the police officer could reasonably believe that the placement of the jacket on top of the bag was used to further conceal items. The court also addressed the lower courts’ concern of reliability of the reports by the employee and the officer. The court notes that the employee’s report was then corroborated by the admission of the defendant, and further, that the employee served as a citizen informant who the officer could reasonably rely on as one of several factors for determining probable cause. Here, the Court determined that the lower courts erred in concluding that the police officer lacked probable cause to arrest the defendant. Accordingly, the Court reversed the judgments of the courts below. 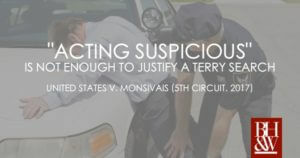 Does an Officer’s Testimony That a Person was “Acting Suspicious” Establish Reasonable Suspicion to Support a Terry Stop? The Fifth Circuit Court of Appeals recently handed down an opinion concerning the reasonable suspicion standard required for law enforcement officers to conduct a Terry stop—an exception to the warrant requirement. The issue facing the Court was whether merely “acting suspicious” is enough to establish reasonable suspicion to justify a law enforcement officer to initiate a Terry stop. While on patrol in a marked police car, two officers observed Monsivais walking down the side of the I-20 interstate away from an apparently disabled truck. The officers stopped in front of Monsivais and activated the car’s emergency lights in order to ask Monsivais if he needed roadside assistance. As Monsivais approached, he ignored the officers and walked past their patrol car. At this point, the officers exited their vehicle, and asked Monsivais where he was going and if he needed any help. Monsivais told the officers he was heading to Fort Worth (even though his vehicle was pointed towards Abilene). During questioning, Monsivais appeared nervous and repeatedly placed his hands in his pockets; however upon the officer’s request, Monsivais removed his hands. Additionally, Monsivais responded politely to all of the officers’ questions. After approximately four minutes, one of the officers advised Monsivais that he was going to pat Monsivais down for weapons because of his behavior, inconsistent statements and for officer safety reasons. Shortly thereafter, Monsivais told the officer that he had a firearm in his waistband. The officer seized the firearm and Monsivais was later charged with possession of a firearm while being unlawfully present in the United States. The Court first determined that the officer seized Monsivais for Fourth Amendment purposes when he told Monsivais that he was going to pat him down. At this point, the officer converted the roadside assistance “welfare check” into an investigative detention—otherwise known as a Terry stop. “The Fourth Amendment generally requires officers to obtain a warrant before searching or seizing an individual.” However, pursuant to a narrow exception announced in Terry v. Ohio, 392 U.S. 1, 88 (1968), police officers may briefly detain a person for investigative purposes if under the totality of relevant circumstance they can point to “specific and articulable facts” that give rise to reasonable suspicion that a particular person has committed, is committing, or is about to commit a crime. United States v. Hill, 752 F.3d 1029, 1033 (5th Cir. 2014). Here, the Court found that while Monsivais’ behavior might not have been typical of all stranded motorists, the officers could not point to any specific and articulable facts that Monsivais had committed, was committing, or was about to commit a crime before seizing him. The court explained that Monsivais’ nervous demeanor alone was insufficient to create reasonable suspicion of criminal activity in order to justify a Terry stop. In fact, the Court gives little or no weight to an officer’s statement that a suspect appeared nervous. United States v. Portillo–Aguirre, 311 F.3d 647, 656 (5th Cir. 2002). Moreover, the Court held that evidence of Monsivais placing his hands in his pocket is of little significance. The Court noted that any number of people walking down the street might have their hands in their pockets. Additionally, the Court determined there were no inconsistencies in Monsivais’ story; and, even if there were, the inconsistencies would not connect Monsivais with any reasonably suspected unlawful conduct. Moreover, Monsivais’ choice to ignore the officers’ presence by merely walking past them, not fleeing, did not give rise to criminal activity. In conclusion, the officer testified that he never suspected Monsivais was involved in any criminal activity, but rather that Monsivais was just acting “suspicious.” As such, the court found that the officer seized Monsivais without reasonable suspicion and that the evidence obtained from the unlawful seizure should have been suppressed. Criminal Penalties for Refusing a Breath Test—Are They Coming to Texas? Can Texas Charge a Person with a Crime for Refusing a Breath or Blood Test During a DWI Stop? In Texas, when a person refuses to provide a breath or blood specimen when being arrested for alleged drunk driving offense, their driver’s license is typically suspended. But, can a state have a law that additionally makes it a crime to refuse a breath or blood test? 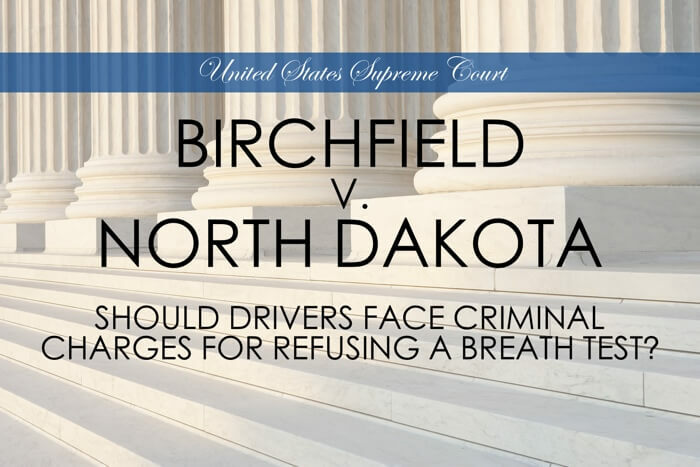 In Birchfield v. North Dakota, the United States Supreme Court held that a state can attach a criminal penalty to those that refuse to submit to a warrantless breath test but they cannot for those that refuse to submit to a warrantless blood test. In a previous blog post we discussed the oral arguments that took place in this case and briefed the three cases facing the court, Birchfield , Bernard and Beylund. Birchfield had been criminally prosecuted for refusing a warrantless blood draw; Bernard had been criminally prosecuted for refusing a warrantless breath test; and Beylund, while not criminally prosecuted for refusing a test, submitted to a blood test after the officer told him the law required it. Birchfield v. North Dakota 579 U.S. ____ (2016). First, the Court determined whether warrantless breath and blood tests were proper searches incident to arrest for drunk driving. The Court held that since “breath tests are significantly less intrusive than blood tests” and in most cases adequately serve law enforcement interests, the Fourth Amendment permits a warrantless breath test but not blood test as a search incident to arrest for drunk driving. Next, the Court addressed the argument that when making the decision to drive on a public road, drivers are deemed to have given consent to submit to a blood test. Applying the Fourth Amendment reasonableness standard, the Court held that “motorists cannot be deemed to have consented to submit to a blood test on pain of committing a criminal offense.” Birchfield, 579 U.S. ____ (2016). In conclusion, the Supreme Court held that States may enact laws that attach criminal penalties to the refusal to submit to a breath test but they may not enact such laws that will apply to refusal to submit a blood test. So what does this mean for Texas? Well, while we do not currently have laws in place that attaches a criminal penalty to refusal of a breathalyzer, the State could enact a law that makes it a crime to refuse to provide a warrantless breath test incident to arrest of drunk driving. 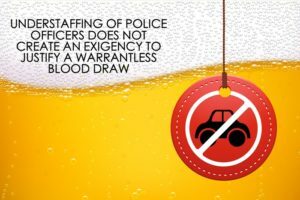 In a Warrantless DWI Blood Draw Case, State Offers “Understaffing of Police” as an Exigent Circumstance. After traveling eighty miles an hour in a forty miles per hour zone, Jeremy Bonsignore pulled into a Waffle House and started walking toward the restaurant. Unknown to Bonsignore, law enforcement had been following him for several minutes. Once the officer pulled into the parking lot, he activated his lights and began yelling at Bonsignore to stop walking. Bonsignore turned around, stumbled, and lost his balance. The officer noted the presence of a strong odor of alcohol and that Bonsignore’s eyes appeared glassy. Bonsignore admitted to having a few drinks earlier in the day, which prompted the officer to conduct several field sobriety tests. Bonsignore failed them and then abruptly refused to do anymore tests or provide a breath or blood sample. Bonsignore was placed under arrest at 1:49 am. Dispatch informed the officer that Bonsignore had two prior DWI convictions, which could amount to Bonsignore being a repeat DWI offender, a felony offense. With this information in mind, the officer instructed a second officer to take Bonsignore to the hospital for a mandatory blood draw. The blood draw was conducted at 2:55 am. Bonsignore did not consent to the taking of his blood and the officer did not obtain a warrant. Before trial began, Bonsignore filed a motion to suppress the results of the blood draw, arguing that the blood draw was warrantless, and therefore, unconstitutional. The motion was never officially ruled upon, although the court did take the motion under advisement. During trial, when asked why he ordered the blood draw, the officer said that Bonsignore’s “two prior convictions were his only authority for obtaining the blood draw.” The officer did not attempt to obtain a search warrant, and he acknowledged that Bonsignore did not give his consent to a blood draw. The officer testified that he relied solely on the statute, Texas Transportation Code 724.012, for authority to order the draw against Bonsignore’s will. Pleading guilty to the charges, the trial court issued Bonsignore a two-year sentence. Bonsignore appealed, arguing that his motion to suppress the evidence should have been ruled upon because the blood draw was taken without his consent and without a search warrant, violating the ruling in Missouri v. McNeely, 133 S. Ct. 1552 (2013). The State argues that (1) Bonsignore’s blood-alcohol level would dissipate over time, (2) he was a repeat felony offender, and (3) the police department was small and understaffed, and that obtaining a warrant in this case would have been overly-burdensome for the officers that night. Is “Dissipation” an Exigent Circumstance to Justify a Warrantless Search? In the wake of the McNeely case, the Second Court of Appeals must determine whether Bonsignore’s blood draw was constitutional, and, whether the State may rely on an exigency “emergency circumstances” argument as an exception to the Fourth Amendment. Section 724.012(b)(3)(B) states that blood or breath samples may be required to be taken when the suspect is arrested for DWI and he refuses to give the specimen voluntarily, so long as the suspect has two prior DWI convictions, “although [the code] does not expressly authorize taking the specimen without a warrant.” State v. Swan, 483, S.W.3d 760, 764 (Tex. App.—Fort Worth 2016, no pet.). However, “the explicit refusal to submit to blood testing overrides the existence of any implied consent and that implied consent that has been withdrawn by a suspect cannot serve as a substitute for the free and voluntary consent that the Fourth Amendment requires.” State v. Villarreal, 475 S.W.3d 784, 800. “The natural metabolism of alcohol in the bloodstream [does not] present a per se exigent circumstance justifying an exception to the Fourth Amendment’s warrant requirement for nonconsensual blood testing in all drunk-driving cases.” McNeely, 133 S. Ct. at 1556, 1558. The Second Court of Appeals agreed with Bonsignore. “The police may not create their own exigency to make a warrantless arrest or search.” Parker v. State, 206 S.W.3d 593, 598 (Tex. Crim. App. 2006). “Exigent circumstances do not meet Fourth Amendment standards if [law enforcement] deliberately creates the [circumstances].” Id. Here, the Court held, law enforcement knew that it was not a “No Refusal Weekend” in Texas. Further, the police department knew that it only had three officers on duty the entire night Bonsignore was arrested. In fact, understaffing the department was a typical occurrence. There was nothing out of the norm about the number of officers on duty that night. “Deliberately scheduling an insufficient number of patrol officers on an evening shift does not constitute an exigent circumstance.” State v. McClendon, NO. 02-15-00019-CR, 2016 WL 742018 (Tex. App.—Forth Worth, Feb. 25, 2016, no pet.). Additionally, the department had a protocol for obtaining warrants, even in the absence of magistrates “on call.” Also, there was no earth-shattering emergency or problem that prevented the officers from making attempts to secure a warrant for Bonsignore’s search. The Court makes a point to highlight the efficiency of fax machines for the purposes of securing warrants, “thanks to the fax machine, [law enforcement] could …request a search warrant” and “thanks again to a fax machine…once [law enforcement] had the search warrant, [they] could fax it directly to a hospital instead of driving [the warrant] there.” The argument that the police department is small was unpersuasive for the Second Court of Appeals. For these reasons, the Second Court of Appeals reversed the trial court’s ruling, and remanded the case to the trial court for a new trial. William Smith was stopped by police for driving without a seatbelt. Immediately, law enforcement suspected Smith of driving under the influence because of the “extremely strong smell of alcohol” coming from Smith. Accordingly, law enforcement administered several field sobriety tests and determined that Smith “exhibited clues of intoxication.” Smith became belligerent after being arrested, and refused a breathalyzer. Law enforcement searched Smith’s car incident to his arrest, finding three open containers that were “cold to the touch.” Dashboard camera footage captured the entire stop. Law enforcement decided to transport Smith to a local hospital for a blood draw because a quick check of Smith’s ID showed that he had two prior DWI convictions. The blood sample taken at the hospital reflected a blood-alcohol concentration of .21 grams of alcohol per 100 milliliters of blood—well above the legal limit of .08. Smith elected a bench trial. At trial, the State called a forensic scientist to testify about Smith’s blood sample. The forensic scientist testified that Smith’s blood alcohol level exceeded the statutory minimum of .08. Shortly thereafter, there was discussion between the judge and counsel about Texas case law in regards to whether the court must have an “order” signed by a judge or magistrate in order for a blood alcohol test to be admitted into evidence. The defense counsel stated, “I would…object…on constitutional grounds [because] there should be a written order [in evidence].” The State replied that law enforcement was “operating under the laws of the State.” The judge seemed to agree with defense counsel, “No…the legislature allows for this…but that doesn’t mean the law is constitutional.” The judge decided to “carry” the constitutional issue so that each side could research and make a formal brief before the court. However, at the end of the trial, Smith was convicted of DWI. The judge stated the “video of [Smith] showed signs of intoxication, but the judge was surprised…that [Smith]…did as well as he did on the [field sobriety tests]” given the .21 blood alcohol concentration. The judge sentenced Smith to twenty-five years imprisonment. There were no further objections on the record made by defense counsel post-judgment. On appeal, the court of appeals reversed Smith’s conviction because the blood sample was obtained without a warrant, violating the Fourth Amendment. State appeals to the Court of Criminal Appeals, arguing that Smith did not preserve error at trial with regard to his Fourth Amendment issue, and as a result of the failure, Smith was precluded from raising a constitutional argument on appeal. The Issue Before the CCA – Did the Defense Preserve Appeal of the Blood Draw Issue? The CCA must determine whether defense preserved error so that the fourth amendment search and seizure issue could be raised on appeal. To preserve error, defense counsel must obtain a ruling on the complaint, or object to the trial judge’s refusal to rule.” Tex. R. App. P. 33.1(a)(2) However, “even evidence that is improperly admitted is considered in determining whether the evidence is sufficient to support a conviction.” Soliz v. State, 432 S.W.3d 895, 900 (Tex. Crim. App. 2014). Here, the CCA determined that the trial judge declined to rule on the Fourth Amendment constitutional issue at the time, but decided to “carry” the issue. Garza v. State, 126 S.W.3d 79, 83 (Tex. Crim. App. 2004). The CCA says that although the trial judge admitted the blood-alcohol test results, he did not rule on Smith’s initial objection, and thus, error was not preserved in this case. “In any event,” says the CCA, “there was…evidence to support [Smith’s] conviction aside from the blood-test results.” “Smith never asked for a ruling on the [constitutional issue], nor did defense counsel object to the trial judge’s failure to rule. In sum, failure to preserve error on a fourth amendment search and seizure argument for warrantless blood draws in DWI cases precludes a defendant from raising the constitutional argument on appeal. Just when we thought the warrantless blood draw issue was starting to reach firm footing in our appellate case law, the Texas Court of Criminal Appeals (CCA) throws a wrench into it. 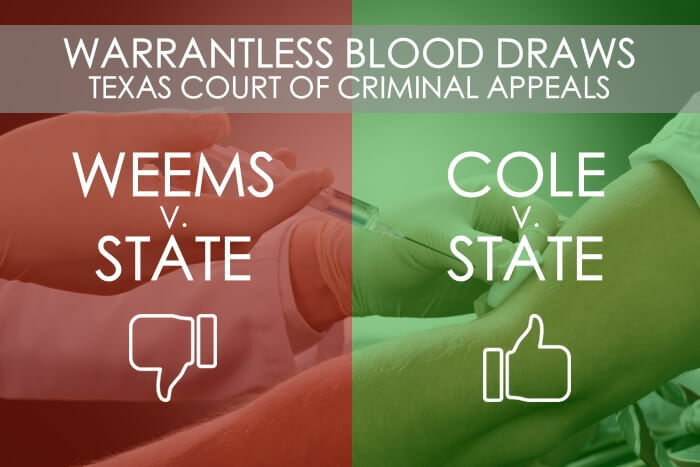 This week the CCA handed down a confounding set of opinions relating to warrantless blood draws in two separate DWI cases—Weems v. State and Cole v. State. Both cases dealt with drivers who were alleged to be intoxicated, both cases involved serious car accidents, both drivers suffered injuries, and, both cases presented law enforcement with the difficult decision to obtain blood samples without a warrant, as the body’s natural metabolic process threatened to destroy evidence over time that could have been used to charge and to prosecute the suspected intoxicated drivers. Procedurally, both Weems and Cole argue that the Texas Transportation Code § 724.012 is at odds with the Fourth Amendment and McNeely. Let’s take a look at the facts of each case and briefly review Texas law to reveal the reasoning behind the surprising conclusions reached by the CCA. FACTS: Daniel Weems drank heavily at a bar for several hours one summer evening in June of 2011. Weems decided to drive home around 11:00pm, and on the way, his car veered off the road and flipped over, striking a utility pole. A passerby stopped to help, but saw Weems exit the car through his window. When asked if he was alright, Weems stumbled around saying that he was drunk. Noticing the smell of alcohol, the passerby called 911 and watched Weems run from the scene. When the first police officer arrived at midnight, Weems was found hiding under a parked car. Law enforcement noted his bloodshot eyes, slurred speech, and inability to stand without assistance in the police report. Moments later, a second police officer came to the scene and arrested Weems on suspicion of driving while intoxicated (“DWI”). Law enforcement decided against conducting field sobriety tests because Weems suffered injuries and had “lost the normal use of his mental and physical faculties due to alcohol.” TEX. PENAL CODE § 49.01 (2)(A). Weems, however, refused a breathalyzer and a blood test, even after law enforcement informed him of the potential consequences (suspended license, etc.) for refusal. Emergency responders transported Weems to a nearby hospital because Weems complained of neck and back pain. Weems was seen in the hospital’s trauma unit and the second police officer completed the form, requesting a blood draw, while the first police officer remained on duty, but on standby. Weems blood was taken at 2:30 am, over two hours post-arrest, with a result of .18—well above the .08 legal limit. Relying on the Supreme Court case Missouri v. McNeely, where the highest court held that the body’s natural metabolic processing of alcohol in the bloodstream does not create an exigency (emergency) such that an exception to the Fourth Amendment’s warrant requirement is created, Weems sought to have the results of the blood draw suppressed at trial. The trial court did not grant the suppression and jury found Weems guilty of felony DWI, sentencing him to eighty years’ imprisonment. On appeal, Weems argued that his Fourth Amendment rights were violated. 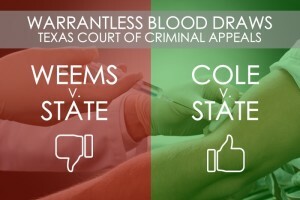 Surprisingly, the Fourth Court of Appeals agreed with Weems, holding that in light of McNeely, Texas’s implied consent and mandatory blood draw schemes do not give way to warrant-requirement exceptions, and, that the record established at Weems’s trial did not support admitting the warrantless blood draw results under an exigency exception. The State appealed to the CCA. FACTS: On a December evening in 2011, Steven Cole drove his vehicle 110 miles per hour down a busy street, running a red light, and crashing into a pickup truck. The crash caused a large explosion and fire, killing the driver of the pickup truck instantly. When the first police officer arrived at the scene around 10:30pm, he saw Cole shouting for help because he was trapped in his truck in the fire’s path. Shortly thereafter, several police officers arrived and began putting out the multiple fires to secure the area for pedestrians and motorists. Law enforcement would later testify that “from a law enforcement and safety perspective, they needed as many officers on the scene as they could possibly get” because the raging fires and continued explosions put the public in danger. When the crash occurred, the police were in the middle of a shift change which further complicated securing the scene, conducting the investigation and maintaining public safety. Cole was eventually rescued from his truck and was examined by EMTs, to whom Cole admitted that he had taken some meth. Because of the large debris field that spanned an entire block, fourteen police officers remained at the scene to collect evidence and secure the area, which pushed the limits of the small precinct’s manpower. The debris field was not fully cleared until 6:00am—almost eight hours after the crash. Because of the size of the debris field and dangerousness of the scene requiring multiple officers to secure, only one police officer accompanied Cole to the hospital. At the hospital, Cole was observed complaining of pain, but also, “tweaking” and shaking—potential symptoms of suspected methamphetamine intoxication. Under a directive from the superior officer on duty, the police officer arrested Cole at 11:38pm and asked Cole for consent to collect blood and breath samples. When Cole refused, the officer read the statutory consequences for failure to consent. Cole interrupted the officer several times to comment that he had not been drinking, rather, he had taken meth. The officer made a request to the hospital for a blood draw, which was done at 12:20am. The results confirmed that Cole’s blood contained amphetamine and methamphetamine. Cole moved to suppress the evidence at trial, but the trial court overruled the motion. The jury convicted Cole of intoxication manslaughter, sentencing Cole to a life imprisonment. On appeal, the court of appeals held that the lower court erred in not suppressing Cole’s blood draw results because State v.Villarreal “foreclosed on the State’s reliance on the mandatory blood-draw provision found in the Texas Transportation Code, and that, the trial court record did not establish that an emergency (exigency) existed to justify the warrantless blood draw. Cole v. State, 454 S.W.3d 89, 103 (Tex. App—Texarkana 2014). The State appealed to the CCA. The Fourth Amendment to the United States Constitution provides, “the right of the people to be secure in their persons, houses, papers, and effects, against unreasonable searches and seizures, shall not be violated, and no Warrants shall issue, but upon probable cause.” U.S. CONT. amend. IV. 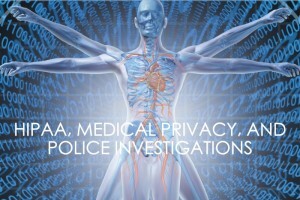 McNeely informs that blood tests are Fourth Amendment searches that implicate a “most personal and deep-rooted expectation of privacy.” McNeely, 133 S. Ct. at 1558-59 (quoting Winston v. Lee, 470 U.S. 753, 760 (1985)). 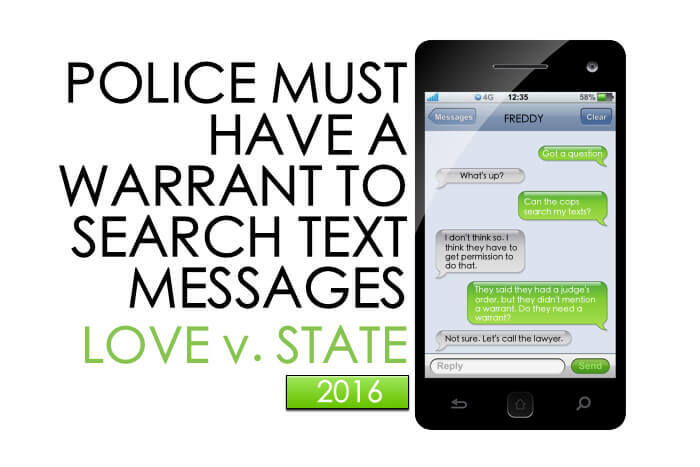 Case law has determined that “a warrantless search is reasonable only if it falls within a recognized exception.” State v. Villarreal, 475 S.W.3d 784, 796 (Tex. Crim. App. 2015), reh’g denied, 475 S.W.3d 817, (Tex. Crim. App. 2015) (per curiam). One exception to the Fourth Amendment warrant requirement is a warrantless search performed to prevent imminent evidence destruction when there is no time to secure a warrant. Cupp v. Murphy, 412 U.S. 291, 296 (1973); McNeely, 133 S. Ct. at 1559. Whether law enforcement faces an emergency that justifies acting without a warrant calls for a case-by-case determination based upon the totality of the circumstances. Id. In order for courts to determine whether an emergency existed, courts must analyze the totality of the circumstances based on an objective evaluation of the facts reasonably available to law enforcement at the time of a search, and not based on 20/20 hindsight of the facts as they are known after the fact. Brigham City, Utah v. Stuart, 547 U.S. 398, 404 (2006); Ryburn v. Huff, 132 S. Ct. 987, 992 (2012)(per curiam). The CCA Weighs In—What did the CCA Decide and How Did the Judges Reach The Decisions? In both Weems and Cole, the Court of Criminal Appeals had to determine whether the warrantless blood draws were justified by exigent (emergency) circumstances under a totality of the circumstances review of the facts. It may be surprising that in one case the CCA upheld the legality of the blood draw and in the other case the CCA held that the blood draw was unlawful. The charts below shed some light on the relevant facts of each case that the CCA reviewed to determine the holdings in each case. As you can see, the cases are quite similar, yet have some striking differences—differences that distinguished each case just enough for the CCA to arrive at opposite conclusions. Refused consent to breath and blood tests. Refused consent to breath and blood tests. Driver caused car crash. Driver caused car crash. Driver injured in crash. Driver injured in crash. Admitted to drinking during initial questioning. Admitted to using meth during initial questioning. Moved to suppress evidence at trial. Moved to suppress evidence at trial. Warrantless blood draw. Warrantless blood draw. 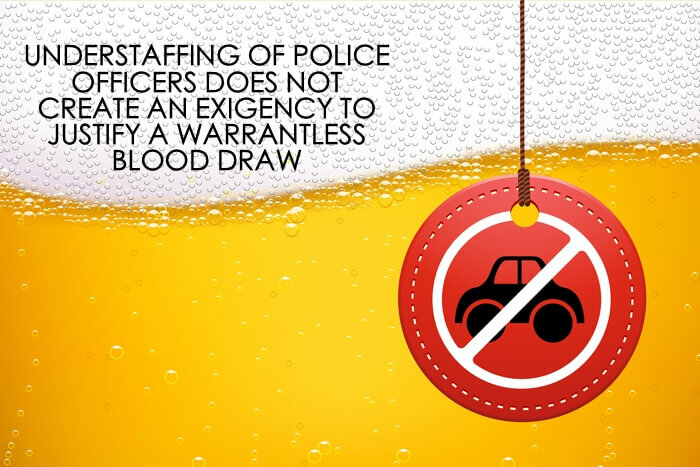 Law enforcement claimed “exigency/emergency” as reason for warrantless blood draw. Law enforcement claimed “exigency/emergency” as reason for warrantless blood draw. Law enforcement concerned BAC would fall over time, destroying potential evidence. Law enforcement was concerned intoxication levels would fall over time, destroying potential evidence. Small, rural road. Large, high-traffic intersection. Two police officers, one who remained on “stand-by”. Entire police department tasked with maintaining and securing the exceedingly dangerous scene. No deaths as a result of crash. One fatality as a result of crash. Small debris field. Large “one block long” debris field. Alcohol was the substance at issue. Meth was the substance at issue. Alcohol has a ‘known’ dissipation time. Meth has a ‘lesser known’ dissipation time. Police department’s manpower was not overwhelmed by the crash. Police department’s manpower pushed to the limits by the crash. Nothing on the record to indicate Weems was going to receive pain medication that would impact the results of a blood test. Hospital was set to give narcotics to Cole because of pain, narcotics that could potentially impact the results of a blood test. 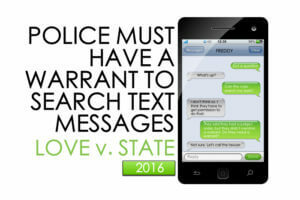 In Cole v. State, the CCA held that the trial record established circumstances rendering obtaining a warrant impractical and that the warrantless search was justified under the exigency exception to the Fourth Amendment’s warrant requirement. The case was reversed and remanded to the court of appeals. The CCA said that the size and severity of the accident scene requiring several police officers to remain on the scene for public safety concerns, the large debris field that required accident investigators extended time to complete the investigation, the fact that someone died in the crash, and the fact that the dissipation rate for methamphetamine is not widely known among law enforcement the way alcohol dissipation in known, are reasons that come together to create a constellation of exigency under a totality of the circumstances analysis. “Law enforcement was confronted with not only the natural destruction of evidence though natural dissipation of intoxicating substances, but also with the logistical and practical constraints posed by a severe accident involving a death and the attendant duties this accident demanded.” Further, because Cole complained of pain, law enforcement had a legitimate concern that any narcotic drugs administered would impact the outcome of a blood test, rendering the test ineffective for evidence in trial later on. Should Drivers Face Criminal Charges for Refusing a Breathalyzer Test? 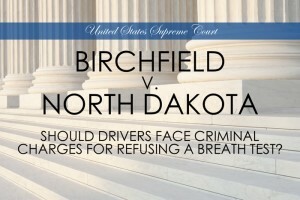 On April 20, 2016, the Supreme Court of the United States (“SCOTUS”) heard oral arguments in Birchfield v. North Dakota, a case that consolidates Birchfield with Bernard v. Minnesota and Beylund v. Levi, where the SCOTUS will determine whether the government may, without a warrant, make it a crime for a motorist to refuse to take a blood-alcohol test. Currently, thirteen states make it a crime to refuse any form of drunk-driving tests (breathalyzer, field sobriety, etc.). Birchfield comes on the heels of the 2013 Missouri v. McNeely case, where the SCOTUS held that if police have time, they should get a warrant before taking an invasive test of a suspected drunk driver. Let’s take a look at each consolidated case to understand the big issue before the Supreme Court. In Birchfield, motorist Danny Birchfield drove his car off of a North Dakota road and subsequently failed a field sobriety test and a preliminary breath test, given by the state highway patrol. At that point Birchfield was arrested, told he had to take another more invasive chemical test, and informed of North Dakota’s implied consent rule. In North Dakota, any individual who operates a motor vehicle on any public or private road in the state is deemed to have consented to a chemical test for alcohol in the blood stream. Birchfield refused to submit to any further testing and was charged with both DUI and Failure to Submit to chemical testing. Birchfield filed several appeals, arguing that North Dakota’s implied consent law is unconstitutional under the 4th Amendment of the United States Constitution. Birchfield is opposed to “refusal” being a crime all by itself. Read the brief in Birchfield here. In Bernard, police confronted a man who smelled of alcohol on a public boat ramp and asked him to consent to field sobriety tests. Bernard consented to a breathalyzer test after being told of the criminal penalties for refusal. Under Minnesota’s implied consent law, it is a criminal offense for a driver who has been arrested on probable cause for driving while impaired to refuse a chemical test. Minnesota argues that a warrantless breath search is constitutional under the “search incident to an arrest” doctrine. On the other hand, Bernard argues that a breathalyzer is not a valid search incident to an arrest because the search does nothing to further officer safety or to preserve evidence. Read the brief in Bernard here. In Beylund, law enforcement observed a car driving erratically and stopping in the middle of the road. The police asked defendant Beylund to consent to chemical testing. At trial, Beylund argued that the test imposed an unconstitutional condition on his driver’s license. Read the brief in Beylund here. The Big Issues—Implied Consent or Criminalization of a Constitutional Right? When drivers obtain a driver’s license from a state agency, does a driver impliedly consent to invasive chemical testing to detect the presence of alcohol? Is refusing an invasive chemical test criminal in and of itself? Do citizens have the constitutional right to refuse an invasive chemical test without penalty? Do states have a compelling interest in protecting public roadways from drunk driving so that they may order chemical testing for suspected drunk drivers even without a warrant? Can a government benefit (such as driving on public roadways) be conditioned upon search requirements, even if the search is an invasive chemical test? What Will the Supreme Court Say About Warrantless Breath Tests? Several national organizations, such a Mothers Against Drunk Driving (see the MADD brief here) and the American Civil Liberties Union (read the ACLU brief here), have filed amicus “friends of the court” briefs for this case arguing for and against the constitutionally of implied consent laws. In the past decade, 112,998 people have been killed in alcohol-impaired driving crashes. With grim statistics underpinning many of the individual states’ implied consent laws, will the Supreme Court overturn or add to McNeely? It will be very interesting to see how the SCOTUS squares this case with the precedent case law and which legal theory they will select to reach a conclusion. Does HIPAA Impact Fourth Amendment Standing When the State Obtains Medical Records in a Criminal Investigation? We’ve all signed the “HIPAA” privacy statements at the doctor’s office before treatment. The HIPAA Privacy Rule mandates nationwide standards to protect our medical records and personal health information by establishing safeguards, such as disclosure rules, patient authorization, and uniform protocols for the electronic transmission of medical data. HIPAA also grants patients the right to their own health information, but what about others? Does HIPAA prohibit the release of health information in a criminal investigation? What if that information is obtained via a grand jury subpoena? On February 13, 2010, Hayden Huse ran off the road and crashed into a cotton field at two in the morning. When law enforcement responded to the scene, they smelled alcohol on Huse’s breath. Instead of giving him a sobriety test, they transported him to the local hospital for injuries he sustained. During the medical exam, the hospital ran routine blood work. A few hours later during an interview with law enforcement, Huse admitted that he consumed six or seven alcoholic drinks the previous evening. However, he refused law enforcement’s request for a breath or blood specimen for blood alcohol analysis. One month later, based upon the police report taken of Huse’s car accident, a Lubbock County Assistant District Attorney filed an application for a grand jury subpoena to obtain Huse’s medical records from the hospital, even though no grand jury had been investigating Huse. The hospital complied with the subpoena, providing Huse’s medical records, along with a business records affidavit. The records revealed that approximately two hours after the car accident, Huse’s blood alcohol concentration was .219—an amount well above the legal limit. Huse filed a motion to suppress the records at a suppression hearing. The trial court granted his motion to suppress on the grounds that the records were obtained in violation of the Fourth Amendment and that the Assistant District Attorney misused the grand jury subpoena process. The State appealed to the Seventh Court of Appeals, which reversed the trial court’s suppression order because “[Huse] lacked standing to raise a Fourth Amendment challenge…and [because] the State did not acquire [Huse’s] medical records through an unlawful grand jury subpoena.” State v. Huse, No. 07-12-00383-CR, 2014 WL 931265 (Tex. App.—Amarillo Mar. 6, 2014). Huse filed a petition to the Court of Criminal Appeals for a discretionary review of his case. The Court of Criminal Appeals set out to determine whether the Health Insurance Portability and Accountability Act of 1996 (“HIPAA”) impacts Fourth Amendment standing when the State obtains medical records in a criminal matter, and, whether the State acquired Huse’s records via a grand jury subpoena that potentially violated HIPAA. Under the Fourth Amendment, “the right of the people to be secure in their persons, houses, papers, and effects, against unreasonable searches and seizures, shall not be violated.” U.S. CONST. amend. IV. “The provision protects people, not places.” Katz v. United States, 389 U.S. 347, 351 (1967). In order to raise a Fourth Amendment claim, a person must have legal standing, that may be “predicated on…a reasonable expectation of privacy principle.” United States v. Jones, 132 S.Ct. 945 (2012); Florida v. Jardines, 133 S.Ct. 1409 (2013). In Hardy, the CCA recognized that when the State itself extracts blood from a DWI suspect, and then subsequently conducts a blood alcohol analysis, then two “discrete searches” have occurred for a Fourth Amendment analysis. State v. Hardy, 963 S.W.2d 516 (Tex. Crim. App. 1997). The State neither extracted the sample nor conducted the blood alcohol analysis. As a result, the CCA concluded that the “Fourth Amendment does not apply to a search or seizure, even an arbitrary one, effected by a private party on its own initiative.” Skinner v. Railway Labor Exec. Assn., U.S. 602, 624 (1989). Further, “society [does not] recognize a reasonable expectation of privacy in privately-generated and maintained medical records that would show the result of a blood alcohol analysis [in a DWI investigation].” Hardy, 963 S.W.2d at 525-27. The CCA Decides Whether HIPAA Trumps the Holding In Hardy? Here, the CCA says that the State neither extracted nor analyzed Huse’s blood sample—the third-party hospital did. Huse, therefore, has no Fourth Amendment standing because he had no reasonable expectation of privacy in his privately-generated and maintained medical records. Further, “whatever interests society may have in safeguarding the privacy of medical records, [such interests] are not strong to require protection of blood-alcohol test results taken by hospital personnel solely for medical purposes after a traffic accident.” Id. But what about HIPAA? Does HIPAA trump the holding in Hardy? In sum, Huse had no expectation of privacy in third-party generated and maintained medical records for a Fourth Amendment claim, and, no provisions in HIPAA specifically deny the disclosure of health information in the event of a criminal investigation. The CCA affirms the judgment Seventh Court of Appeals that Huse’s medical records shall not be suppressed.